Is it Tuesday already? I guess so!! I know I need a birthday card this week, so I went ahead and got one ready. I have almost run out of my Echo Park Dots and Stripes paper pack. I knew before I got to the final sheets I wanted to pair the brown and blue. I think there is something super fun about this combo. The birthday stamp is from Joy's Life Stamps and all of the shapes are cut with dies. 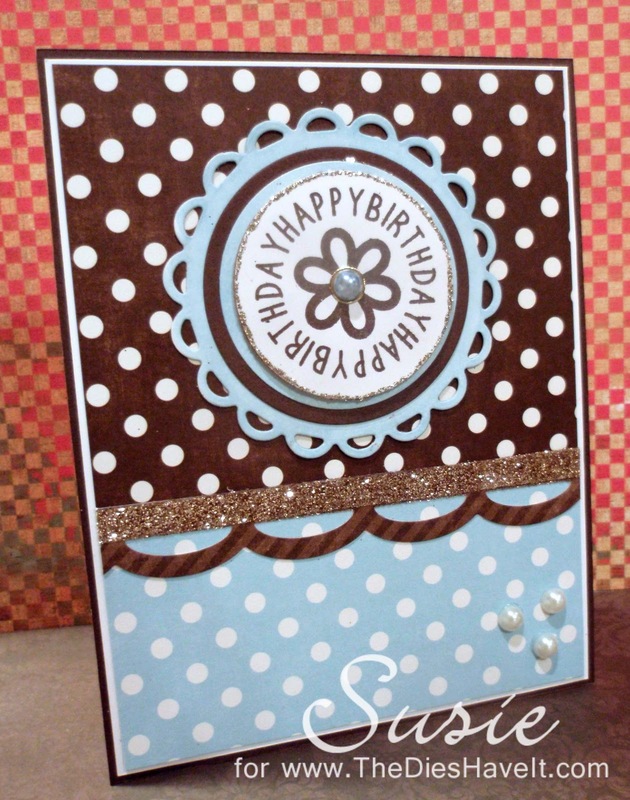 I used lots of circle dies from Spellbinders and the Open Scalloped Edge die from MFT Stamps. Do you like that sparkly strip that matches the edge of the sentiment? I took a thin strip of ScorTape and lined it up along the seam of the two papers and then sprinkled Martha Stewart Fine Glitter over top. I just love the look it gives. I am going to use it on tomorrow's card too! So come back on Wednesday if you can. I will show you another card - VERY different from this one!